AMHSFL - Page 2 of 386 - American Mobile Home Sales of Tampa Bay, Inc.
• 2 bath , 3 bdrm single story – FOR SALE USD25,000 . Handyman Special!! Beautiful, immaculate, magnificent, elegant, and amazing…all of the above accurately describe this 2012 Nobility Maria located in Cypress Creek Village, one of the finest manufactured home communities Central Florida. Totaling 1196 interior square feet, with three bedrooms, two bathrooms, and even a rear Florida Room with access to BONUS REAR PATIO!!! You will not find a more complete home in this price range. One more thing: the lot is situated close to nature, providing you with privacy with no rear neighbors. This home is truly special, in showroom new condition. Call Tanya for your private showing at 863-557-7550. You may also visit www.mobilehomegirl.com for more photos! Winter Haven is a beautiful area which boasts the “Chain of Lakes” – 16 lakes connected by channels. There are many excellent shopping centers including a Wal-Mart Super Center on Cypress Gardens Blvd. Winter Haven Hospital, Heart of Florida Hospital….not to mention the many lakes and golf courses. All of this is within 10 miles of Cypress Creek Village. LOVELY 3 BEDROOM SPLIT FLOOR PLAN, TURN KEY FURNISHED! 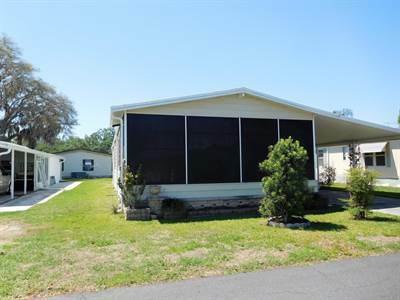 in Sarasota, Sarasota Announcing a price drop on 91 Loren Way, Orange Acres MHC, a 1385 sqft , 2 bath , 3 bdrm manufactured home “AFFORDABLE 55+ COMMUNITY IN PRIME LOCATION!”. Now FOR SALE USD79,965 . This Could Be Your Florida Dream Come True! 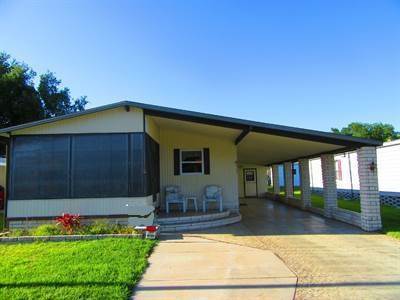 • 1000 sqft , 2 bath , 2 bdrm manufactured home – FOR SALE USD69,900 . Where to begin? This home is so perfect that words and pictures cannot do it justice! The home shows better than brand new with wood panel walls, an enclosed 10′ x 40′ addition (2014), a screened in Florida room and deck (2012), double paned windows throughout, laminate flooring (2017), and an updated kitchen with a newer refrigerator (2016) and an updated bathroom (2015). The enclosed addition contains two very comfortable living rooms, and a combined bath/laundry room (Maytag 2011 washer and dryer). The smaller living room could easily be converted to an additional bedroom or office/craft room. New paint has been added throughout the original unit. Included with the home are the beds, nightstands, dining room table and chairs, and all appliances. Now for the outside of this amazing home! There is a 2 1/2 ton Frigidaire air conditioner (2014), vinyl siding that was redone in 2014, a shed for your extra storage needs, and water outlets on both sides of the home. The roof was updated in 2011 with shingles. The concrete carport is long enough to fit three vehicles, and did I already mention the Florida room and deck overlooking the lake? The view is so relaxing and beautiful that I have to warn you-you will not want to leave once you see this home! Fifth Wheel-Steal of a Deal! 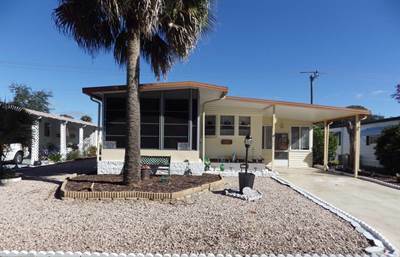 • 900 sqft , 1 bath , 1 bdrm manufactured home – FOR SALE USD23,000 . This fifth wheel has never been taken out on the road and was only moved five miles from the site of origin when it was new in 2007. It cost $57,000 at that time and that was prior to the addition of the built-on Florida room that measures 12′ x 23′. 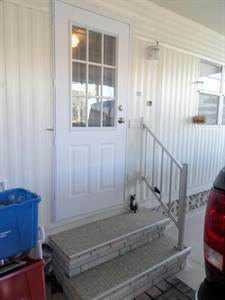 There are three slide outs in this fifth wheel, and it will be sold completely furnished. Recent upgrades to the home include a new hot water heater that runs off either gas or electric, new vinyl windows in the Florida room, new carpeting in 2016, a new ceiling fan in the kitchen/dining area, and a new skylight in the shower in 2018. In addition, the roof has been rubber coated every two years, most recently in November, 2018. Extra features included with the home include an electric fireplace, a central vacuum, and in-house stereo speakers for the living area and bedroom. A real plus for this home is a lake view without the lake view lot rent price! (Because of a road separating the home from the lake, the lot rent is the lower lot rent price of $450 per month.) The furnishings include a sofa sleeper in the Florida room and new three inch memory foam on the king size bed. The home also includes an apartment size washer and dryer inside the home with a larger washer in the shed for bigger loads. 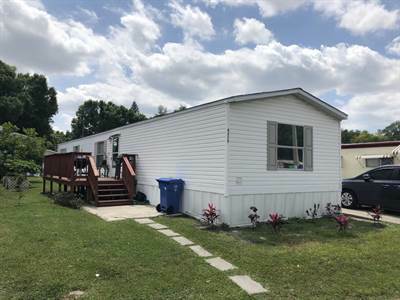 Feel free to make an offer on this adorable, well cared for fifth wheel with bonus Florida room, and enjoy living carefree in a beautiful park with plenty of activities! Living Room: 20′ x 13′ 8″ Includes all furnishings, fireplace, and computer desk. Kitchen/Dining Area: 20′ x 10′ Includes Magic Chef propane range, Amana full size refrigerator with ice maker, and Amana microwave. Master Bedroom: 7′ 9″ x 9′ 7″ Includes all furnishings, including blankets and bedding. 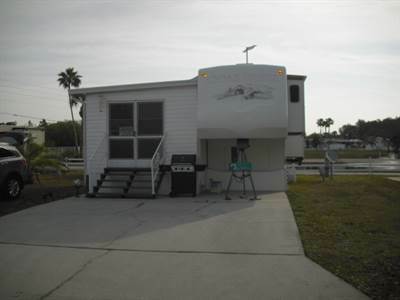 Florida Room: 12′ x 23′ Includes all furnishings and has access to extra storage under the flooring of the fifth wheel. Shed: 6′ x 8′ Includes full size washing machine. 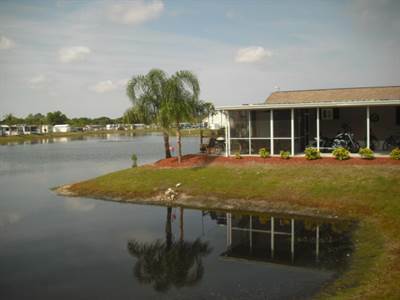 Three Lakes RV Resort is an all-age gated community located in Hudson. The lot rent is $450 per month and includes lawn care and trash collection. The park is active with a pool, dog park, nature trail to walk, shuffleboard, fishing, fitness center and plenty of planned activities. It is a short drive to Hudson beach on the Gulf and SunWest beaches. It is also close to hospitals and all major medical needs. All listing information is deemed reliable but not guaranteed and should be independently verified through personal inspection by appropriate professionals. American Mobile Home Sales of Tampa Bay, Inc. cannot guarantee or warrant the accuracy of this information or condition of this property. The buyer assumes full responsibility for obtaining all current rates of lot rent, fees, or pass-on costs associated with the community, park, or home from the community/park manager. American Mobile Home Sales of Tampa Bay, Inc. is not responsible for quoting of said fees. 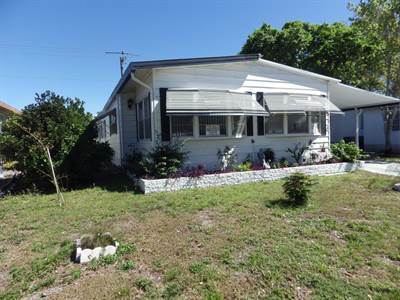 in Park East, Sarasota Announcing a price drop on 2118 York Drive, a 1140 sqft , 2 bath , 2 bdrm manufactured home “AFFORDABLE 55+ COMMUNITY!”. Now FOR SALE USD47,900 . Updated Home Ready for New Owners!